Now that tenHsGadget has been installed on your Vista computer, and is running in the Sidebar, you are ready to select which Devices you want to monitor and appear in the Device List and which Events you want to appear in the Event List. Open the Options panel and click on the Select Devices button. Select a Location to display a list of all of the Devices in that location. Mark the checkbox next to each Device that you want to appear in the Device List. Do this for each Location. You can use the Exclude Types and Exclude Locations buttons to mark Device Types and Locations that you always want to exclude from the Device List to simplify the Device Selection task when you have many plugin-generated Devices. Now click on the Select Events button and select all of the Homeseer Events that you want to appear in the Event List. When you are finished selecting Devices and Events, click the OK button to close the Options panel. When the Options panel closes and the Device List is displayed, you might be surprised to see that there are still no Devices shown in the list. This is because the default criteria for displaying a Device that has been selected is to display the Device in yellow if its Device Status is 2 (ON), display the Device in grey if the Device Status is 4 (DIM), and not to display it at all if its Status is any other value (normally, OFF). 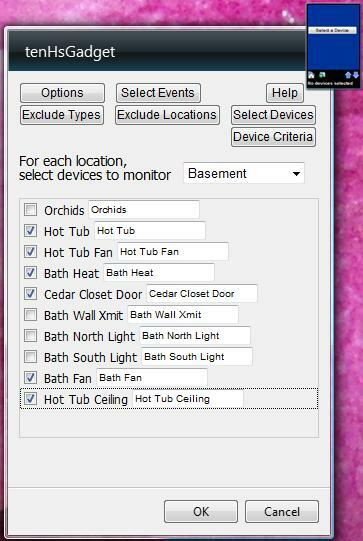 This default display criteria allows you to monitor a list of Devices and display only those that are ON or DIM. If you click on any Device in the list, the Device flyout will open that displays the current status of the Device and allows you to control it as well. Click the Select button to display a different Device, even one that has not been selected to be included in the Device List. We now have a functioning Device List with the default display criteria. Now we can modify how the selected Devices are displayed (or, not displayed) in the Device List.